My family planned a trip into Goblin Valley during spring break. 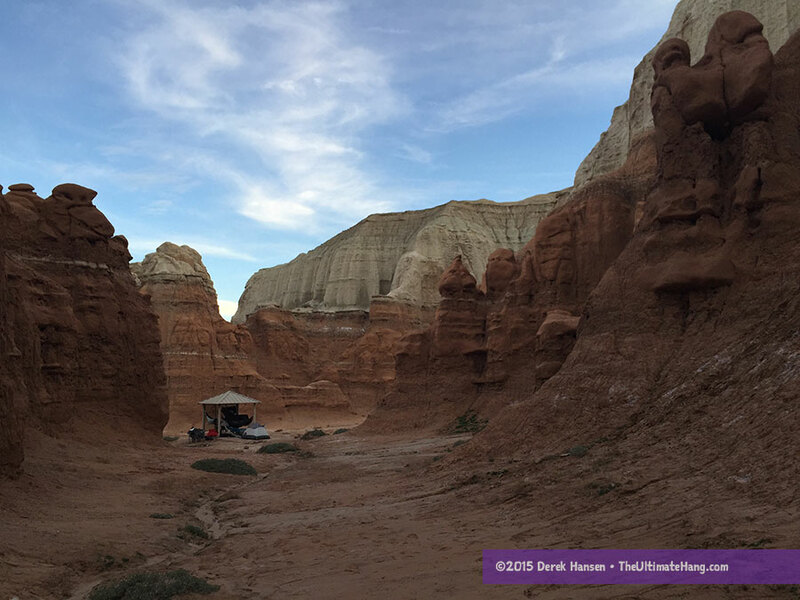 It was part of our plan to get out and see more of the natural wonders in the American Southwest. Our plans, of course, included sleeping in hammocks. 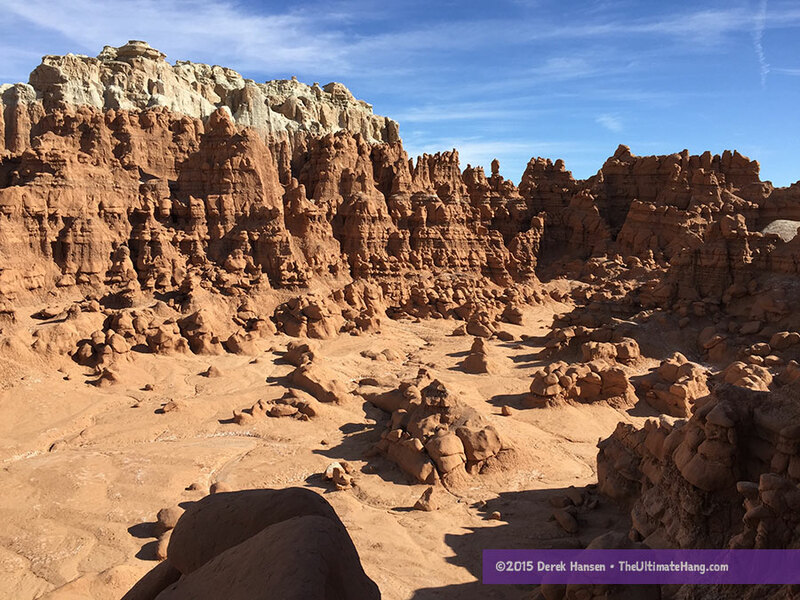 Goblin Valley is well-known for its amazing hoodoo formations, but it doesn’t have much in the way of vegetation. I’ve lived most of my life in the Southwest, and still I was amazed at how little was growing in the area. The rock formations are also, surprisingly, very soft and camping is only permitted in the campground (i.e., hanging on the hoodoos is a no-go). Our only option was to bring hammock stands and rely on the pavilion. Thankfully, the pavilion was just big enough to fit hammocks, but only slightly. Like many campground pavilions I’ve encountered, this one had posts that were roughly 10 ft (3 m) apart. This didn’t allow much room for long hammocks or inflexible suspension systems. This trip was a good example of planning ahead and doing some field improvisation. Knowing the pavilion might be small, I brought along a few shorter hammocks, less than 10 ft (3 m) in length, to hang between the main posts. These worked great for my kids. Across the diagonal, I knew I could hang any hammock between 10 and 11 ft (3 and 3.3 m) and have enough space for a variety of suspension options. I planned on hanging high, above the table. I anticipated that we could hang up to four hammocks along the perimeter of the pavilion and one across the axis. While we could have stacked hammocks, I knew this wasn’t the most convenient for everyone. I did plan ahead and brought a portable hammock stand, the BooneDox Drifter. It compacts neatly and fit easily into the back of our van. We set it up on the tent pad to provide another hanging point. The Drifter is not a high stand, so long hammocks do not work well. However, I did hang a Therm-a-Rest Slacker Single hammock on it, with about 5 in (12.7 cm) of ground clearance when occupied. Each campground is supplied with its own pavilion, tent pad, and campfire ring. When we arrived and began driving through the campground, I noticed that some pavilions had sun shades bolted to one or two sides. This worried me a little because it would limit how many hammocks we could hang. Our site had a sun shade on one side, so having the stand allowed everyone to hang who wanted to. One thing I need to confess: I haven’t always loved hammocks. In fact, when first transitioned to hammock camping, I felt more comfortable with the fully-enclosed Hennessy Hammock because of the psychological barrier I was used to with a tent. For whatever reason, I felt more secure. It didn’t take too long before I started to enjoy the enhanced views and “open” feeling of any hammock system. 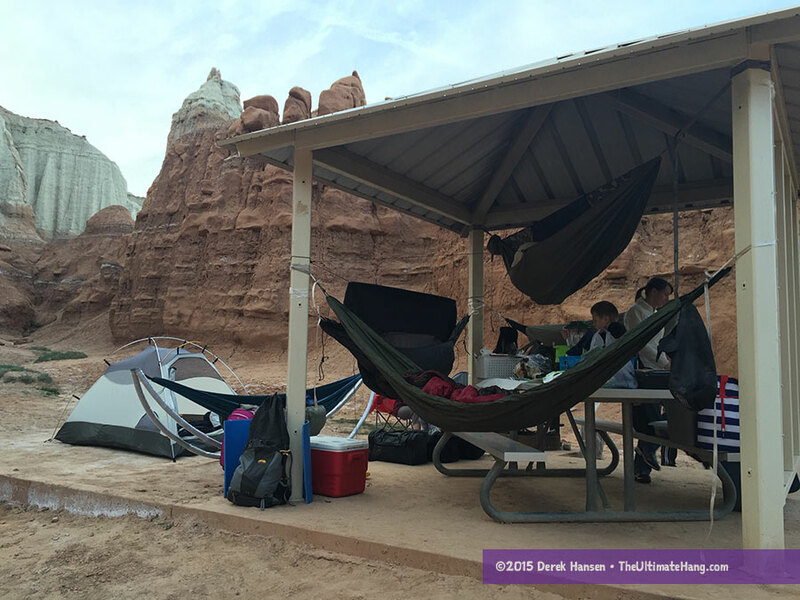 I’ve noticed the same behavior with some of my own children, so having a tent was a necessity for this trip. I also have a child still in diapers, and having a tent is much easier to accommodate those needs. In my own experience, I’ve also noticed that kids and youth often fair better in a hammock if it has an integrated bug net (or top cover)—a jungle hammock. An enclosed top keeps sleeping gear, pads, and occupants from slipping around at night. For the parents, it means less sleep interruptions to adjust bedding. For our first night, we had to make some adjustments to our sleeping arrangements, which meant switching out a basic hammock with a jungle hammock—the modular Dream Hammock ThunderBird). The ThunderBird fit perfectly between the posts—at least from end-to-end—but it was fitted with Whoopie Sling suspension, which meant it had 8 to 10 inches (20 to 25 cm) of “dead” space that I had to eliminate. For really short hangs—where the anchor points are so close together, like in the pavilion at our camp—it helps to have short end loops on the end of the hammock. 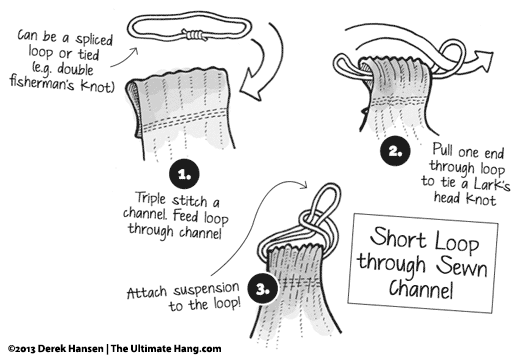 These ends loops allow for clipping or tying as close to the anchor as possible. In fact, for really tight hangs, like in this case, I had to eliminate any extra space as possible, which meant no hardware and a connection point as close to the hammock end as possible. Since the Whoopie Slings were so long, I cut about 10 in (25 cm) off the tail on each side and tied continuous loops using a Double Fisherman knot. I affixed each loop to an end using a Lark’s Head knot. I adjusted the size of the loop to be right at the end of the hammock (so it didn’t extend past the end of the hammock) by wrapping the loop multiple times (essentially tying a Prusik knot). I fastened a webbing strap around the steel posts and tied a slippery Becket Hitch to the hammock. This is one of my favorite hammock suspension knots because I can adjust it so minutely with very little slack. It is also very easy to tie and untie when used with a strap in this manner. For the slippery, metal posts, I wrapped the webbing straps multiple times, which provided a secure anchor point. One advantage to using hammocks around the pavilion was that we could detach one side and store them away during the day to open up the pavilion for foot traffic (eating meals, playing games, etc.). I’m not a huge fan of campgrounds overall. They tend to be noisy and crowded, and privacy is minimal. 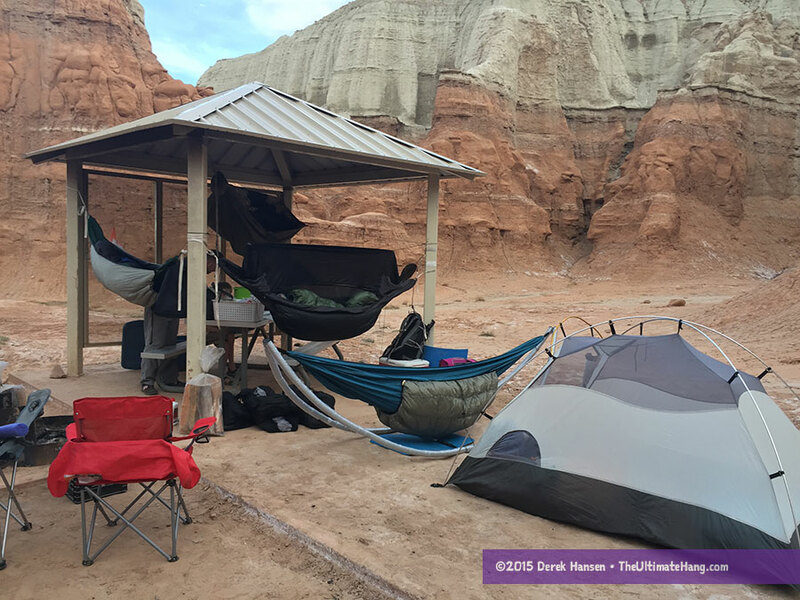 At Goblin Valley, these downsides were amplified because there were no barriers between the campsites—no trees and no vegetation. However, there are two campsites that are somewhat secluded and offer the most privacy: sites 4 and 12. The semi-private grotto is the backdrop to site 12. Of the two, site 12 is the best. It has its own “private” grotto and is tucked up and away, out of site of nearly all other sites. We reserved this site months ago and it was worth it. Plan for and expect dust. And sand. We all wore sandals, which eliminated some of the annoying “I’ve got sand in my shoes” issues. Dressing in layers helped with the variable temperature shifts. Using hammocks kept most of the sleeping gear protected from sand and dirt that often gets carried into tents (those in our tent had sand everywhere). I packed all the sleeping bags and quilts in large storage bags that helped ease packing so we didn’t have to touch as much of the ground. The weather in March was also ideal, with highs in the upper 70s°F (20s°C) and lows in the low 40s°F (~4°C)—our first night dipped into the 30s°F (~-1°C). One night brought some stiff breezes, but they didn’t last. The daytime temperatures meant we could stay out longer exploring the hoodoos (“goblins”) together. Although the campground was completely full every night, the crowds at the hoodoos were minimal. In fact, we hardly saw or encountered anyone at all. We had a blast exploring, playing, and imagining all the wonders in the valley. Overall, it was a fun trip, full of memories and adventure. This was a very thorough explanation of your fun family trip complete with hammock details. Loved it all. Thanks for the excellent write-up Derek! Next time out head up temple wash. There are some great spots to hang and it has some great history. Cool! I’ve never heard of that spot. I’ll do some research on it and check it out. I have both a Thunderbird and a Dangerbird and had wondered about how to hang them when there was limited space between anchors. I’m not great with knots and rely on diagrams and up close photos or videos. I’d love if you could post a video or series of photos/diagrams to demonstrate how you converted the dream hammock’s whoopie to a continuous loop and hooked everything up directly to the strap without hardware. Thanks for this trip report with your family – awesome! Linda, I’m going to shoot a video today to show you how I did it. I’m glad that I ran into you at Goblin valley. I ended up getting your book and am in the process of making our own hammocks. Thanks for the tips.